Fondue parties are a fun and chic way to celebrate the holidays and spend quality time with friends and family. Warm pots of cheese and chocolate to gather 'round on a cold winter night? What more could you ask for? Fondue parties are known for their whimsical charm, so play up the theme by using dishes and cutlery that echo this. One great idea is to display dippers on a multi-tiered cake stand for an elegant look. Choose plates, napkin rings and glasses in sparkling silver, gold or icy blue to keep the setting beautiful and inviting. Before guests arrive, arrange the area where you'll be enjoying the fondue. Set your Oster® Titanium Infused DuraCeramic™ 3-Qt Fondue Pot on a low table that has ample room for people to sit around it. Set up a place setting for each party participant with a napkin, small plate and fork and knife. Guests can dip their foods, then place them on their individual plates and enjoy them. 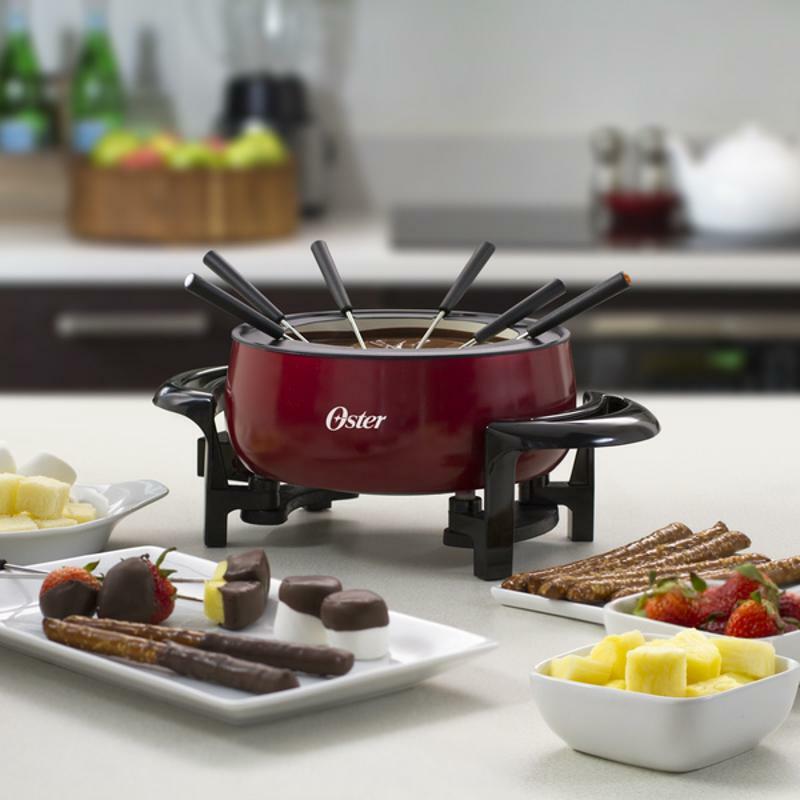 Invite friends over for a holiday fondue party with the Oster® Titanium Infused DuraCeramic™ 3-Qt Fondue Pot. A fondue party is all about effortless chic, and one held during the holiday season should be a winter wonderland! Hang white string lights around your party space, and place candles on tables and countertops for a soft glow. Some tinsel and vases of evergreen leaves complete the look, while guests will appreciate thick, textured blankets placed around the seating area. Heat the Oster® Titanium Infused DuraCeramic™ 3-Qt Fondue Pot. Brush garlic cloves across bottom of pot and leave in. Add the cheeses. Once the cheeses begin to melt, add the flour, stirring to incorporate. Then add the milk, butter, white win, lemon juice, salt and black pepper and stir to mix until smooth. Continue mixing every few minutes until the fondue is ready to be enjoyed. Cap off the evening with sweetness with a show-stopping chocolate fondue. Serve with treats like marshmallows, crisped rice squares, pound cake cubes, strawberries, pineapple, grapes and banana slices. If you want to put a holiday twist on basic chocolate fondue, you can flavor it with cinnamon, nutmeg caramel, butterscotch or peppermint. Heat the Oster® Titanium Infused DuraCeramic™ 3-Qt Fondue Pot. Place chocolate chips in fondue pot. Once they begin to melt, add the heavy cream, milk and vanilla and stir to combine. Stir continuously before serving. Get creative and use holiday-inspired dippers at your Christmas fondue party. Try gingerbread cookies, peppermint sticks, dried figs, cranberries, pumpkin bread slices, cinnamon rolls, snickerdoodle cookies - whatever your imagination can come up with! At the end of the evening, spread the holiday cheer by giving your party guests a Oster® Titanium Infused DuraCeramic™ 3-Qt Fondue Pot of their own. It's a holiday gift they'll love.